Guitar-slinger Dan Sartain talks to fellow Alabama native and cult movie star George Hardy below. His new album, Too Tough To Live, is a frenzied burst of machine-gun songs aimed at anything from Vietnam to Fridays, and includes guest star Jane Wiedlin from The Go-Go’s on ‘Now Now Now’. It is out on One Little Indian on 30 January 2012. For more information go to Dan Sartain’s MySpace or One Little Indian website. George Hardy is the star of Troll 2 (1989) and its companion documentary Best Worst Movie (2009). Dentist by day and B-movie celebrity by grace of God, George is a hometown hero in his native Alexander City, Alabama. Troll 2 maintains a 0% rating on Rotten Tomatoes and a rating of 2.3 on Internet Movie Database: some have called it the worst movie of all time. It has horrible acting, awful dialogue, cheap sets, ridiculous costumes, and some not-so-special effects. What keeps Troll 2 from actually being the worst movie of all time, however, is how watchable it is. The movie flows seamlessly from one hilariously bizarre scene to the next. Most B-movies have moments of unintentional humour in them, but they are few and far between. Viewer fatigue is a non-issue with Troll 2. If Plan 9 from Outer Space must be dethroned by any movie, it had better be Troll 2. Best Worst Movie is so much more than a ‘making of’ documentary. It is a film about turning a personal worst into a personal best. In 1990, Troll 2 was a straight-to-video embarrassment for George Hardy. His VHS copy of the film sat behind his television set collecting dust for the better part of two decades. Any hopes of a future in acting were gone. For 20 years George tried his best not to think about the film, but it would not go away so easily. The people who watched Troll 2 grew up and went to college in the ironic 2000s, and they never forgot what they saw. As the movie got passed around from party to party, Troll 2 finally found an audience as a dark comedy rather than a horror/fantasy genre piece. Troll 2 screenings and parties started popping up nationwide: the movie sold out the Alamo Drafthouse in Austin, Texas, and the Upright Citizens Brigade theatre in NYC, among others. George Hardy got a call out of the blue one day from a radio station asking if he was attending a Troll 2 cast reunion in Salt Lake City. Even though it had been 20 years since he had seen or talked to the other cast members and he only had two days’ notice, George hit the road. The VHS tape was becoming a thing of the past but Troll 2 was more popular than ever. Best Worst Movie follows George and the other cast members as they come face to face with the fans and one another. We get to look into the lives and see through the eyes of the people who made the worst movie of all time. We discover that being part of the joke is a lot better than being the joke. We watch total embarrassment turn into total redemption. For the stars of Troll 2, delayed success was a shock and a blessing. We set out to interview George Hardy in his hometown of Alexander City, located near beautiful Lake Martin. It took us an hour-long trek on a beautiful Sunday through the back roads of Alabama to conduct this interview. If not for other cars on the highway and a few Wal-Marts, it would be impossible to distinguish 2012 from 1962. Much of rural Alabama remains untouched. George Hardy is a Southern gentleman in every sense of the word. 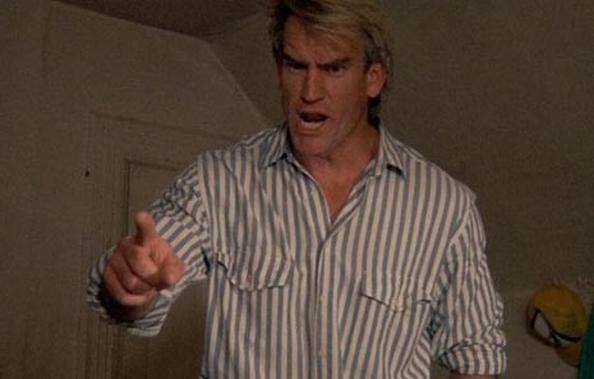 His perfect southern accent shines through in Troll 2 and in real life. It is a true southern accent, not a country accent. There is a subtle difference between the two, but there is a difference. Mr Hardy was a cheerleader for the University of Auburn football team from 1974 to 1977. He keeps a strict workout schedule to this day and it shows. It is hard not to like this man: he seems to be enjoying life to the fullest. After viewing Best Worst Movie, it is what I expected. The film depicts him as a kind and humble southern man, thrust into a foreign world of ironic, young and hip nerds. Still, I was not expecting George Hardy to be the vintage moog synthesizer-collecting, avant-garde music-loving, independent movie-watching intellectual that we met. Everyone we met in Alexander City, Alabama, knew who Mr Hardy was. People in Alexander City know George Hardy The Man before George Hardy The B-Movie Legend. We sat down with him in a taqueria for a chat. George Hardy: So a lot of people want to know about the status of Troll 3. Dan Sartain: It was my first question. I just spoke with Claudio Fragasso [director of Troll 2] on the phone today, and we are moving ahead with it. It’s gonna be called Troll: 3D. The initial concern was, are we going to be able to capture lightning in a bottle twice? Well, I’ve read the script and it’s just great. Rosella Drudi [writer of Troll 2] wrote it, and it’s fantastic. I think we are going to try to shoot half in the US and half in Europe. Are they scouting locations in the US to film Troll 3D? I’m trying to talk them into filming here in Alabama. It would match up visually. Troll 2 found its audience as a dark cult comedy rather than a horror film as originally intended. I think they were going for more horror/fantasy rather than straight horror. Do you think Troll: 3D can be funny now that you and the rest of the cast are in on the joke? I’ve read the script three times now, and there is no doubt in my mind that it will be funny. There have been several horror franchises that have realised the audience was laughing at things that were not intended to be funny. The result was more jokes and intentional humour in horror movies. A prime example would be Evil Dead 2 with Bruce Campbell. Oh, it has Bruce in it? No, but people keep telling me to check out his work. We are supposed to have similar features or something? You both have the same job. B-movie actors with a cult following who fight rubber monsters. Is that right! I’ll have to check it out. What was the green stuff made out of in Troll 2? Glycerin, food colouring, and corn starch or somethin’. It was water-based. In recent years quite a few documentaries have come out about various horror series such as Friday the 13th, Psycho, Nightmare on Elm St and Halloween. Most of them focus more on the technical aspects of making the films. They don’t go home with the stars of the film and get to know them. They play more like a special feature rather than a heartfelt documentary. That’s the last thing Michael Stephenson [the director of Best Worst Movie and star of Troll 2] wanted to do. It took about four and a half years to make Best Worst Movie, it was filmed in about 28 cities and eight countries, which a lot of people don’t know. It’s almost 420 hours of film footage that went into 93 minutes of film. I saw on your IMDB page that you were in Street Team Massacre with Rowdy Roddy Piper (They Live) and Lloyd Kaufman (Troma). I did that and a few other cameos. Most recently I did a movie called Junk for a director named Kevin Hamedani. Those cameo roles are fun, you can jump in and do your parts and leave. You were a cheerleader for the University of Auburn from 1974 to 1977. You were with the team during Coach Shug Jordan’s last season. Do you have any fond memories about the legendary coach? I do! He had an icon status not unlike coach Bear Bryant at Alabama. The head coaches back then had more of an iconic feel than the ones today. I met both Shug and Bear and they were the biggest celebrities I’d met in my life. How did you end up in Utah [where Troll 2 was filmed]? I was doing a post-doctorate programme in children’s dentistry. Four out of five dentists recommend sugar-free gum. Are you one of them? No! I think sugar is good for ya!